Today’s Poppet 1920s Children’s Wardrobe Collection contribution is a spring time dress. I sort of thought of it as an Easter dress when I designed it, but Easter was a few weeks ago. I chose a pale color scheme with soft blue and pink for the dress. With the dress is a matching cloche, because lord knows the 1920s loved a good looking cloche. I know I’ve spoken before about how much I adore 1920s children’s clothing. There’s just something about clothing of that era that I adore. I have equal love for children’s clothing of the 1930s, but I haven’t had as many opportunities to draw that. Maybe that’s a project for another time. I openly confess that I don’t have a good record of what I used as reference when I drew today’s dress. I am pretty sure I used Children’s Fashions 1900-1950 As Pictured in Sears Catalogs, 1920s Fashions from B. Altman & Company and/or Everyday Fashions of the Twenties: As Pictured in Sears and Other Catalogs. All of these books are from Dover which is a great source of reasonably priced fashion history books. I think I own almost all their 1920s fashion books. The realization that fashion history books are a justifiable business expense has made it a lot harder to talk myself out of buying them. 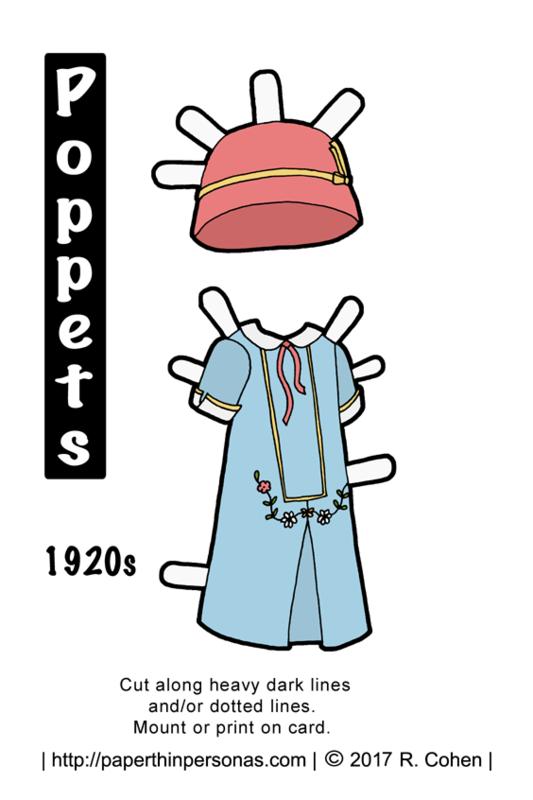 I do realize that recently most of what I have posted for the Poppet’s paper dolls to print have been either from the Fairy Tale project or the 1920s project. Never fear, there are also normal clothing on the horizon. I mean, even paper dolls need jeans. So, what do you think of today’s 1920s paper doll dress? Love it? Hate it? Wish it was purple? Let me know in a comment. Meanwhile, if you want to support the blog, then think about becoming a Patron or liking it on facebook and tune in tomorrow for a paper doll outfit inspired by one of my favorite novels. Need a paper doll to wear today’s outfit? Pick a Poppet Paper Doll Here. The colors you choose are always lovely, but the palettes for your 1920s projects are just about perfect. I think it’s nice that you’ve sort of accidentally created a 1920s themed Poppet set!